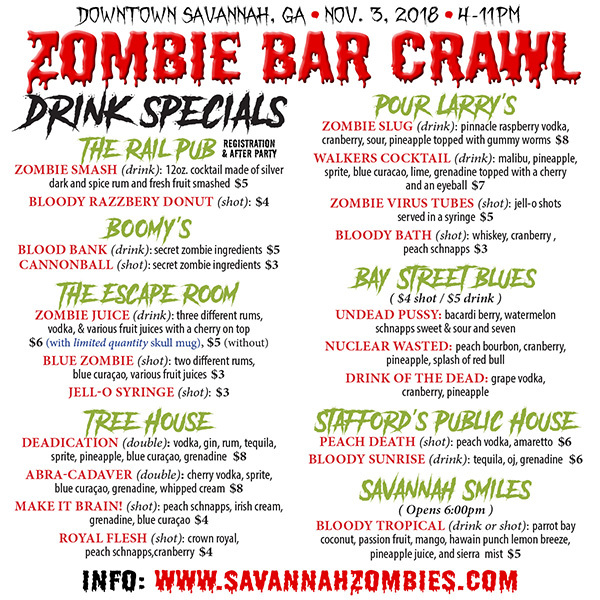 Join the undead masses as the Savannah ZOMBIE BAR CRAWL infects the downtown of Georgia's oldest city on Nov. 3rd (4pm-11pm) – a great way to keep the Halloween season alive (or undead - you pick). Whether you are a survivor, freshly infected, completely turned or even a zombie hunter, make plans now to join your fellow freaks and geeks for a bloody good time! We are still finalizing lots of details but here's what we have so far! • Blood Splatter Booth (optional) - wear old clothes if you want to partake in this fun ticket perk. • Commemorative 1.25" Savannah ZOMBIE BAR CRAWL Pin. ...or course maybe you are a survivor and haven't turned yet....and of course we do need the Zombie Hunters! The ticket holder acknowledges that by attending the Savannah ZOMBIE BAR CRAWL on Nov. 3rd, 2018 he or she (or their likeness) may be recorded (by video, sound or otherwise) and consents to such recordings and its publishing and re-broadcasting. In exchange solely for this license, the ticket holder, in purchasing a ticket: (i) releases the event producer (Markster Con Productions LLC) and participating venues and their associates from any liability for loss, death or damage to persons or property, infringement of any right, or any other claim or cause of action of any kind; (ii) authorizes and permits the event producers and its designees to use for any and all purposes his or her name, voice, and likeness and all reproduction thereof in any and all forms and in all media now or hereafter known in perpetuity. This ticket is non-refundable and will not be replaced. The ticket holder also acknowledges that they are 21 years of age (or older) and that any alcohol consumed will be the responsibility of the ticket holder. The ticket holder also agrees to drink responsibly and bring a designated (sober) driver along with them to the event for safe transportation to and from, if the ticket holder plans to consume alcoholic beverages.